“Planning your financial future does not need to be an overwhelming task. 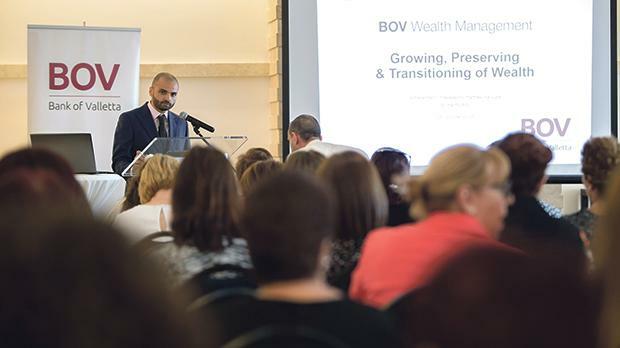 Your financial needs evolve during your lifetime and expert planning and advice are key to planning your short and long-term goals,” said Matthew Farrugia, financial adviser at BOV Wealth Management during a seminar organised by the Malta Union of Midwives and Nurses (MUMN). Financial advisers leverage decades of experience in the world of investments, savings and financial planning to offer the best solutions tailored around one’s risk appetite combined with a hands-off or hands-on approach with minimal logistic demands. Bank of Valletta’s Wealth Management Division offers discretionary portfolio services, advisory investment services and execution-only trading, allowing clients to spend their time on what they feel is most important in their lives – while safe in the knowledge that the fruits of their labour are in good hands.